National Express is Britain’s only scheduled coach operator with a truly nationwide reach. Our fleet of over 550 modern, air-conditioned coaches offers reclining leather seats, on-board WC, free wi-fi, charging points and VUER, our free-to-view on-board entertainment system that lets you watch a wide choice of movies, TV shows, news, sports and even e-books, all streamed free-of-charge to your smartphone or tablet. We serve nearly 1,000 places in the UK, delivering over 19 million passengers every year, safely and comfortably to their destination. So whether you fancy a day shopping in the city, a weekend break at the coast, or being taken straight to the airport door in comfort, with a very generous baggage allowance, look no further than National Express. Spending your National Express e-voucher is easy – just go here, enter your journey and your 2-part voucher code into the blue Journey Planner. The value of your voucher will be deducted from the fares selected. You can use your National Express e-voucher code to book tickets on any National Express scheduled service on the UK mainland, including Airport routes and even our special Festivals and Events services - there are no close-out periods. E-vouchers cannot be used for travel to Ireland or Continental Europe. To redeem your National Express e-voucher code, just visit: www.nationalexpress.com/offers/vouchers.aspx, select your journey details, enter the two parts of your code in the Voucher ID and Security Code boxes (we suggest you 'copy and paste' the code to avoid any typing errors), then enter the number of passengers and choose from the fares on the next page. The value of your voucher will be deducted from the fares offered. Only one voucher code can be used per transaction, for up to 9 people travelling together, and no change is given if the value of your voucher is greater than the fares you choose. 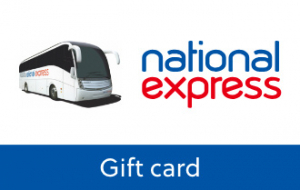 We recommend checking your fares first at www.nationalexpress.com, then order the most appropriate denomination voucher for the fares you need. A £1 booking fee (per transaction, not per person) applies to all reservations, which is payable with a valid debit/credit card, along with any difference between the price of your ticket and the value of your e-voucher. E-vouchers cannot be used at National Express Coach Stations (including airports), ticket machines, agents, on-board our coaches, or our telephone Contact Centre. 6. E-vouchers cannot be used as payment for a National Express Coachcard, but they can be used to purchase a Coachcard discounted ticket. E-vouchers cannot be used in conjunction with any other promotion or discount. 8. A postage fee may apply if you choose to have your tickets printed and delivered to you. There is no postage fee for e-Tickets, including print-at-home tickets. All travel is subject to availability at the time of booking and the National Express Conditions of Carriage apply.